Gen. George Washington resigns his role as Commander in Chief of the Army at Annapolis, Maryland in 1783. (CNN) – In 1796, the idea of a world leader offering a voluntary farewell address was remarkable and rare. In a time of despotic European leaders fighting to stay in power, the thought that President George Washington would cede power – willingly – was seen as extraordinary. But that is exactly what Washington did on September 19, 1796, when he published his "farewell address," as it came to be known, in the American Daily Advertiser, a Philadelphia publication. In it, Washington outlined what the country should do in order to be successful and what he had learned over his 45 years in politics and public service. In particular, the first president warned Americans about the perils of political parties. The address - which after its first publication was quickly picked up by newspapers across the country - was more than just a blueprint for the country’s success. In many ways, it was a symbol of the strength of the American democracy and an example of how power can be transferred without bloodshed and war. The letter, which coincided with the ninth anniversary of the Constitution’s publication, was in effect a call to arms to preserve the American idea. 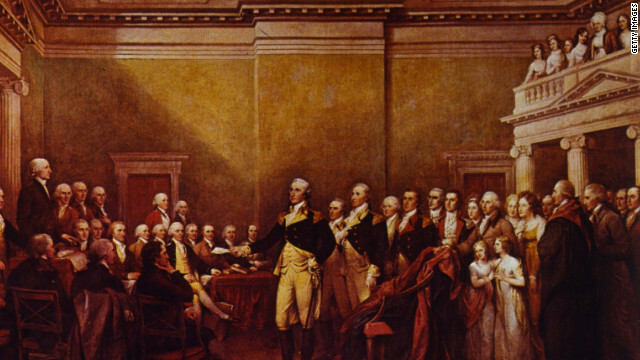 Both in content and in symbolism, Washington’s letter validated American democracy. According to the University of Virginia’s trove of documents about the farewell address, Alexander Hamilton, the first secretary of the treasury and Washington’s close confidant, helped write a great deal of the address. In his draft for Washington, Hamilton used a draft that James Madison had written for Washington in 1792 – the end of Washington’s first term. After Hamilton sent Washington his “major draft,” the president began editing. He used Hamilton’s draft as a major influence, but Washington’s edits ensured that his final salvo was, in fact, his. At the time of his retirement in 1796, Washington was popular and many had assumed that he would serve as president until his death. However, Washington was in poor health, and many speculated the draw of his sprawling plantation in Mount Vernon, Virginia, was enticing to the aging leader. Washington died nearly three years later, in 1799, at age 67. He is now interred at his Mount Vernon estate, along with his wife, Martha. Amazing that 200 and some odd years later, the message still rings true. I can not wait for Obama's farewell address. It is time for him to end his time-of-service. Yea it's going to happen in 2016 four more years for Obama!!! What are you going to gain with King Obama in the Whitehouse? MJ QUIZ TIME ON CNN! MJ,,, What are the 3 Branches of Gubment in the USA's FEDERAL SYSTEM? MJ,,, What is the Branch of Gubment that the DOJ belongs? MJ,,, Who controls the 2 Branches of Gubment? MJ,,, What are the 2 Branches of GUBMENT Controled by OBUMER? In modern times, we see leaders, like Hugo Chavez, who used democracy and free elections to assume power, only to destroy democracy in order to maintain power. Once in power, Chavez eliminated all opposition ... the free press ... and, he disposed of term limits, so that he could stay in power, indefinitely. Today, Americans must keep a constant vigil over our founding father's warnings, and protect our constitution at all costs. Our policies of divided government, separations of power, separation of church and state, term limits, oversight and accountability, and an objective free press, contain the wisdom to sustain a free and successful democracy. Obama needs to step down now for the good of the country. It's obvious that Romney and Ryan hold the keys to the path forward and upward and for Obama to continue to run is nothing but pure selfishness! self serving politicians like Obama is the tyranny that Washington warned us about. Obama must go NOW!!! YOU TEA PARTY IDIOTS NEED TO STEP BACK TO WHATEVER CENTURY YOU COME FROM, FOR THE GOOD OF THE COUNTRY. If you are BLACK, BROWN, AFRO, AFRO-AMERICAN, Afro-Muslim, Afro-Chinese, Afro-Middle-Eastern, Afro-Artic, Afro-Antaric, Afro-South-American, Afro-Carribean, etc!!!! You do know that T has rotted your brain? Watch, Listen, Read, and ENJOY the MUSIC! Can your kids play with your Social Security Money like these kids? Please watch and see if you can see British Royalty Boobies! So then when your eating cat food under a bridge, I guess you would blame Obama for that too?. I think you mean eating 'dogs' under a bridge ... obama's food of choice. Bush was bad, Obama is worse.., 43 months and counting. Bush & Robme have something in common......They're both empty between the ears!. Obama/ Biden 2012!!! Aside from his warning about the danger of factions, Washington advised the country to beware of entangling alliances with other countries. Essentially, he said that we should maintain a respectful, working relationship with all nations, but avoid aligning ourselves too strongly with any of them. This would cause other nations to have undue influence on our own government's workings, and set us up as the enemy of their enemies. Unfortunately, US desire for empire caused the country to ignore Washington's words. spoken as a true anti colonialist..Marxist, just like the moron in the white house. Since when did America colonize anyone...rip them off? You idiot! Ask south korea to look over the border and see what they prefer...ask europe if they wish they were nazis or Russian colonys... reblooded Americans fought for those freedoms and the world benefited. SINCE WHEN? HOW ABOUT YOU READ SOME MORE AMERICAN HISTORY. "when did we colonize anyone/rip them off?" Gee let's think about this, we briefly colonized Monrovia, Liberia (only foreign capital named after a U.S. President, gee I wonder why), we invaded Mexican territory and stole that land, we definitely ripped off the Native Americans when we stole their lands, pushed them west, and gave them small pox laced blankets (this was called the Indian Removal Act, but it's better known today as the trail of tears). Not really so much for colonization, but ripping other people off and screwing them over is definitely an American passtime. hahaha pretty thin response...with no merit. And you know better..I think or you are ill educated. Perfectly describes Netanyahu...expect American presidents to be at his beck and call. . The current middle easy situation will mean nothing to you obama supporters until you suffer the consequences obama has set in motion for you. Then you will sit in desperation and fear and understand your grandchildren will not live in the free and lavish world you did, because of your ignorance and selfishness. @november2012....you managed to say absolutely nothing until finishing with "Then you will sit in desperation and fear and understand your grandchildren will not live in the free and lavish world you did, because of your ignorance and selfishness." News flash. War doesn't create stability or freedom. Further, the people who are so content to let our grandchildren pay our debt are the very same ones who always see war as the solution and taxes as the enemy. The ignorant are who always want to go to war. Intelligent people simply don't think that way. Further, intelligent people realize that the entire Middle East isn't summarized by a few photos. We had neanderthals in our own country climbing fences and chanting USA after OBL was eliminated...that doesn't make it an accurate reflection of our country. The desire for empire was driven by corporate interests, not the government. Big money influences marginal politicians to do all sorts of things against the nation's interest. Profit uber alles. Whether land, trade routes, oil, uranium, etc it is corporate greed that starts wars. Both WWI and WWII were driven by access to middle east oil. Iraq and Afghanistan were both about oil and military bases to protect corporate interests in Saudi Arabia. When you pay for the high price of gas, remember who is making a considerable profit of each gallon, both Muslim extremists bent on our destruction, and the 0.1% who, like Romney, do not care if the 47% survive. Oh,, ASK THEM WHERE THE HQ is for the Cause and get the Address! Then look up the Address and GO TO THE ADDRESS! You want FEDERAL GUBMENT stopping Lemon-ade Stands? Those who do not know history are doomed to repeat it. Old cliche, but oh so true. Washington, Lincoln, both Roosevelts, Eisenhower all warned us of the dangers to our freedoms: the two party dictatorship, corporate control of the economy and government, the military-industrial alliance that bleeds our national treasury. We need a multi-party state, and proportional representation, as they have in many advanced countries. That way, you are not forced to vote for the lesser of evils, but for the individual and ideals you believe in. It also makes it near impossible to buy an election. Couldn't agree with you more, especially about proportional representation. Did you know that the U.S. House of Representatives has not increased in size since the 1920s while the U.S. population has more than tripled? +1 – I too agree with you to what you said.